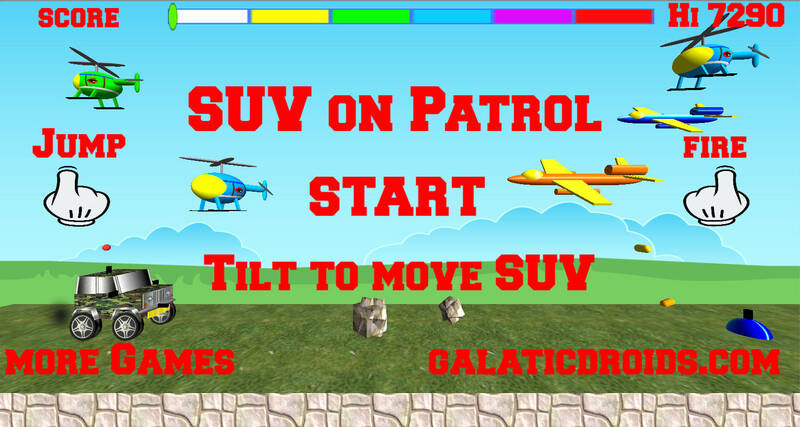 SUV on Patrol Classic arcade action inspired by Moon Patrol, jump into your SUV and get out on patrol. Watch out for mines, you can either jump over them or try to blow them up by shooting them. Enemy choppers will try to destroy your truck, luckily you are equipped with front and top cannons so you have ample fire power to defend your pick up truck. 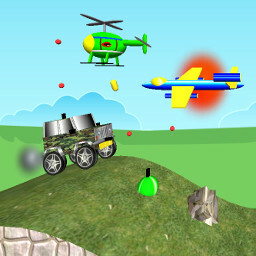 The attacking fighter jet planes move more quickly, but it is possible to shoot them down if you have good reactions. Keep moving, don't get stuck or the enemy will quickly finish you off. Download SUV on Patrol now, climb into your jeep and start blasting the enemy now.